It was so nice to have a weekend to enjoy some special off time with mom and dad! So we took them to some of our favorite hang out places. One is a beautiful beach about 45 minutes away, on a crazy mountain dirt road. They loved it. We sat by the beach, ordered tasty food, and enjoyed a restful day off. We also went to eat at one of the three restaurants we have in town. This one is actually a hotel and restaurant, and the food is really quite tasty. 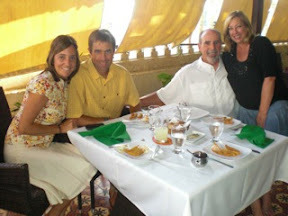 They branched out and tried the goat, a typical Haitian meal, and really enjoyed it! The four of us enjoying tasty food. We ordered the beef in a tasty mushroom sauce. Yum ! Dad enjoying his spot in the shade, right on the clear Carribean ocean. Looking forward to being with you in April. My wife (Christine) and I are coming on the next Liquid Church trip. Thanks for serving in Haiti! Looking forward to learning from you! Previous Previous post: The strange things we do. Next Next post: Plan B.